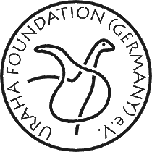 Seismic waves – URAHA Foundation Germany e.V. Seismic waves are intense vibrations which spread out from the initial point of rupture, called hypocenter, like ripples on a pond, but are much more complicated. These waves can travel long distances and cause the ground to shake, and sometimes are extremely destructive near the epicenter – the scientific name for the point on the earth surface above the hypocenter. Earthquakes occur when two tectonic plates move suddenly against each other. The rocks usually break underground at the hypocenter and: the earth shakes! Waves spread from the epicenter, the point on the surface above the hypocenter. 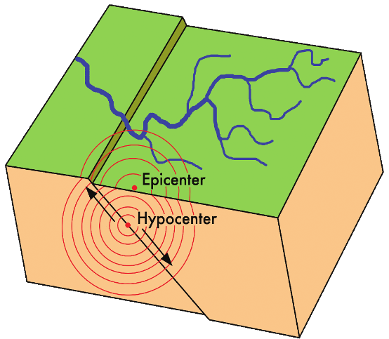 Earthquakes are subdivided according to the depth of their hypocenter into shallow-focus (upper 70 km of the crust), mid-focus or intermediate-depth (70-300 km) and deep-focus earthquakes. The last ones occur along subduction zones, where colder oceanic crust descends underneath another tectonic plate, and can be traces to depths of up to 700 km. 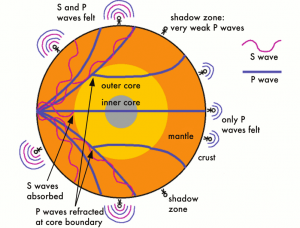 What we know about the earthʼs internal structure originates mostly from the study of seismic waves. When seismic waves pass through rocks of different densities they are refracted at the layer boundaries, just like rays of light are bent in a glass prism, and their velocity changes. Thus we can obtain information on the different layers of the earth by comparing the travel-time and geometry of seismic waves. Different seismic body waves pass through the earth interior. The crust is the brittle outermost layer varying in thickness from 25 to 60 km on continents, compared to 4 to 6 km for oceanic crust. The continental crust is quite complex in structure and is composed from many different kinds of rocks. Below the crust, the denser mantle reaches into depths of 2890 km. 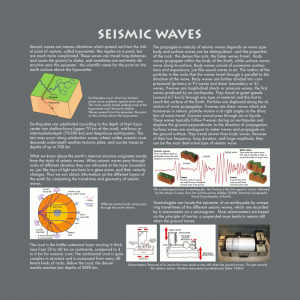 The propagation velocity of seismic waves depends on wave type – body and surface waves can be distinguished – and the properties of the rock: the denser the rock, the faster waves travel. Body waves propagate within the body of the Earth, while surface waves move along its surface. Body waves consist of successive contractions and expansions, just like sound waves in air. The motion of the particles in the rocks that the waves travel through is parallel to the direction of the wave. Body waves are further divided into compressional (primary or P-) waves and shear (secondary or S-) waves. 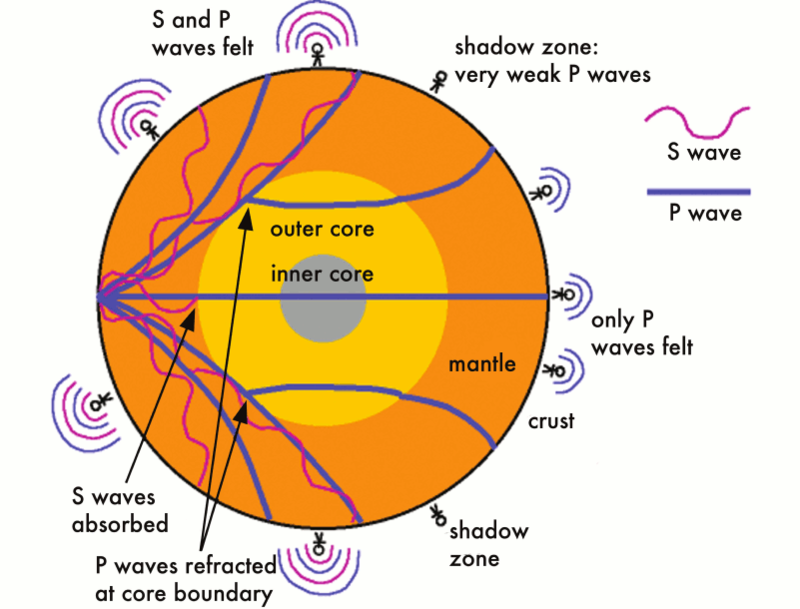 P-waves are longitudinal shock- or pressure waves, the first waves produced by an earthquake. They travel at great speeds (around 6-7 km/s) through any type of material and the first to reach the surface of the Earth. Particles are displaced along the direction of wave propagation. S-waves are shear waves which are transverse in nature, particle motion is at right angles to the direction of wave travel. S-waves cannot pass through air or liquids. These waves typically follow P-waves during an earthquake and displace the ground perpendicular to the direction of propagation. Surface waves are analogous to water waves and propagate on the ground surface. They travel slower than body waves. Because of their low frequency, long duration, and large amplitude, they can be the most destructive type of seismic wave. 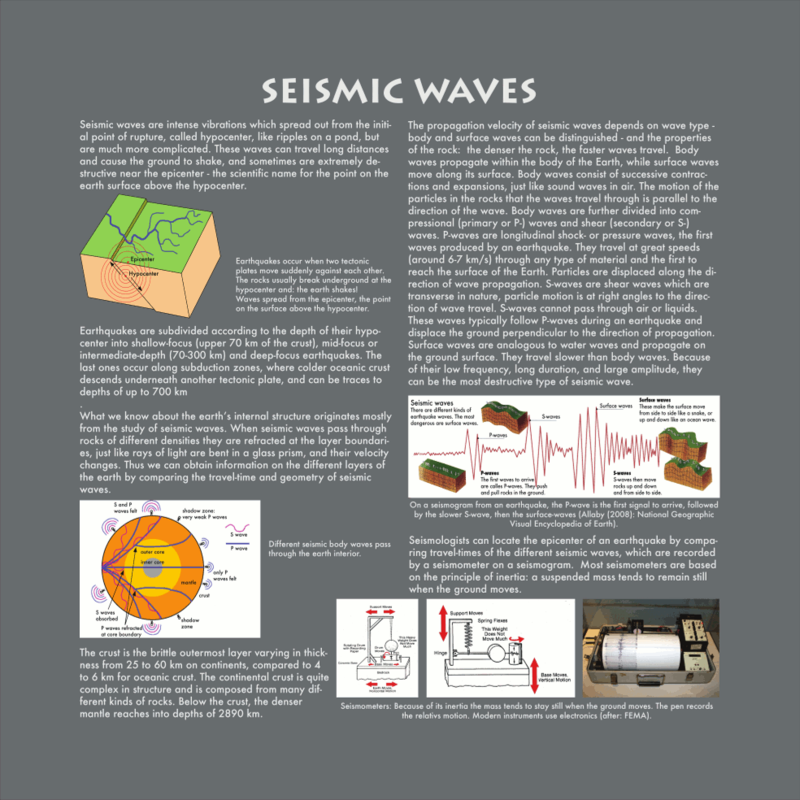 On a seismogram from an earthquake, the P-wave is the first signal to arrive, followed by the slower S-wave, then the surface-waves (Allaby (2008): National Geographic Visual Encyclopedia of Earth). Seismologists can locate the epicenter of an earthquake by comparing travel-times of the different seismic waves, which are recorded by a seismometer on a seismogram. Most seismometers are based on the principle of inertia: a suspended mass tends to remain still when the ground moves.